ITPMI, the Fair of IT solution for the SMEs (Carrara - Italy) . In its stand ENEA presented the Ishtar concept together with the results of other Technology Transfer Projects for the Textile Clothing sector. CEBIT, the most important European Fair on ICT (Hannover - Germany). In its stand NEOSIS presented the Ishtar concept and established contacts and links. SAMAB, the international Fair of the machinery and tools for the clothing industry (Milano – Italy) . 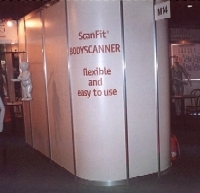 In its stand Cad Modelling presented, with the support of ENEA, the ScanFit body scanner working with the Ishtar system and the Ishtar concept. Brochures were distributed and a certain number of contacts were registered. Fashion-up and pro-fashion, modern distribution and private label fashion show, Modena, March 8-10 2001. Enea participated the meeting section organizing a round table about 'Quick response in the textile clothing sector' and with a speech where a description of the project was presented as a case study for the made-to-measure garments. The two initiatives were promoted by www.profanet.it , a databank and marketplace about the italian subcontracting companies of the textile and apparel sector. The architecture of a high quality catalogue for made-to-measure garments is the first result of the ISHTAR project (Innovative SHops for the Textile and AppaRel industry). The system is based upon servers and standard Internet browsers. The main issues faced in this paper are the definition of an architecture to obtain the best trade off between performance and a high quality of the representation of apparel/textile goods and the introduction of a colour management system that can benefit also generic internet users. In electronic catalogues the quality of the images, their capacity to faithfully represent the real goods, is essential to ensure customer satisfaction. The ISHTAR architecture supports the use of ICC profiles for color management , to assure a faithful reproduction of the colors of fabrics. The ICC framework offers many generic profiles, together with factory made profiles for specific devices. But these may not be available, or accurate enough. Consequently the project provides for the case of a generic Internet user who lacks the skills for characterizing his own display. A procedure for CRT device characterization allows even an unskilled user to define a display device profile, providing moreover the capability to take into account the effect of the user’s room lightning conditions on the appearance of colors.